Two spectators pick cards from a shuffled deck (of cards). The cards are signed and/or notarized and shuffled into the deck. The magician returns the deck to its box and calls upon the restless spirit of Cthulhu to detach itself from the realm of the Elder Gods and, before bringing destruction to the blight of humanity as promised in the slime-dotted pages of the curs-ed Necronomicon, reveal the selected cards. The card box then opens itself and the first selection rises with slow deliberation, betraying the hand of a preternatural presence. To deepen the mystery, the magician then spreads the cards across the table and again calls to the Destroyer of Worlds for assistance. Another card slips from the deck like a demon's claw into the back of a sleeping victim and is revealed to be the second selection. Spectators may then inspect the deck and card box, perhaps risking the wrath of the Great Old Ones who lived ages before there were any men and came to the young world out of the sky to rain terror upon the weak and lesser unless the magician is tipped heavily. The title of this effect -- "Box Monster" -- is a little misleading because the secret behind the effect (a planarian) is not technically a monster (although it can be kept in a box). Planaria, as any magician knows, are common non-parasitic flatworms of the phylum platyhelminthes. They are handy for a variety of purposes because they live in fresh water and don't eat a lot. You can carry one in a vial in your jacket pocket and keep it alive on table scraps indefinitely. The basic Box Monster effect is simply accomplished by first hiding a moderately trained planarian in a card box. The magician allows a spectator to freely select a card and, in the process of shuffling it back into the deck, dabs a little Planaria Chow Paste (available at Petco) on the card. When the deck is returned to the box, the planarian will go after the food with enough force to push the card right out of the box, even if the box's lid is closed. If the magician wishes to perform the two-phase trick, a second planarian is needed. Although the effect ships with only a single creature, a second can be formed by cutting the animal in half. In a few days, both halves will have grown into complete planarians, and so long as the original's brain was bisected the dupilicate will already be trained (for significant cost and time savings). 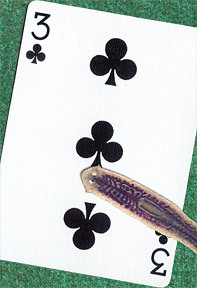 For the second phase, the magician slyly hides the second planarian beneath the deck as it is spread on the table. The creature lunges for the selected card (marked as the first was) and sends it flying from the deck. The magician tosses the second planarian into a pocket while picking up the deck, drops the first planarian down his shirt while picking up the card box, and completes the cleanup by surreptitiously wiping any flatworm slime off the cards and table before offering everything for inspection. Note: If you buy a few plastic cups and cut your planarian in half a second time, creating a third creature, you can perform the classic effect, Cups and Flatworms.